One advantage of “All-in-One Custom Backgrounds for WordPress” is, that you can create an arbitrary number of backgrounds for each page. And every background can be bound to a so called HTML Block Element. To select a specific element, you can use its CSS selector. Simple said, each page is constructed of many HTML Block Elements, and each of these elements can be addressed using a specific CSS selector. The other way around, it is also possible to select multiple elements using one selector. Using CSS selectors isn’t the most easiest thing, if you are not familiar with HTML and the technologies around it. You don’t have to worry. By default the “body” selector is used. This makes sure, the background of the whole page is changed. Note: Some themes might create a structure, which hides the body and the selector is not working this way. Unfortunatly selectors are very theme dependent, which means there are no generic rules, which can be used. An HTML is a contruction of nested HTML elements. Each element in this page is selectable among others by id or css class. The id of element should be unique on page and so you can get the element by id when you insert “#elementID” in selector field. The “#” character indicates that you mean an id of element. The class of element is not unique on page and so you can get one or many elements by class when you insert “.elementClass” in selector field. The “.” character indicates that you mean an class of elements on page. with the developer tools of your favorite browsers. 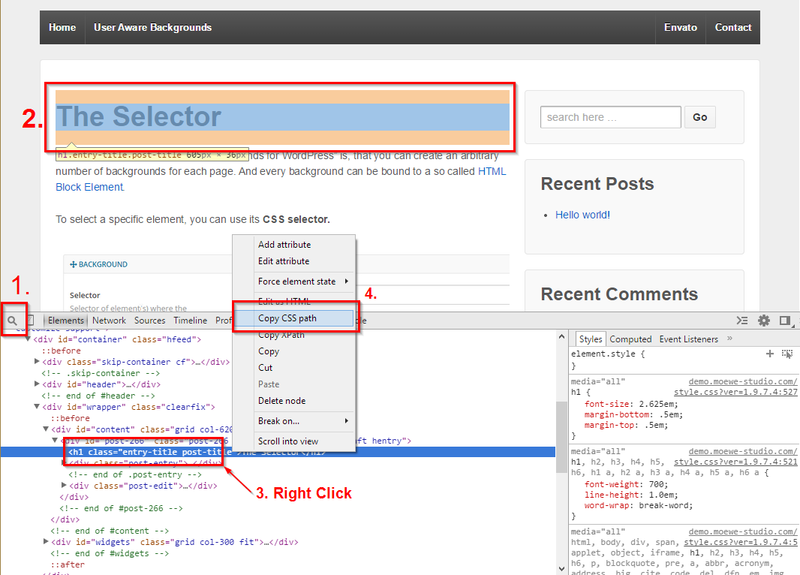 Here is a basic example, on how to find the selector for the pages title. Note: This way you will get a very concrete selector, which might not work for other pages.